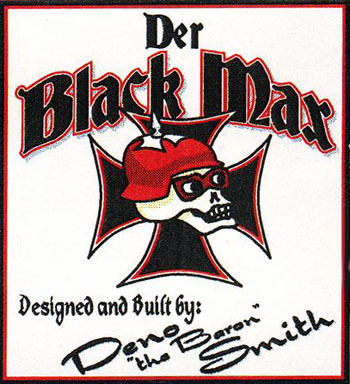 "Der Black Max" started out as an old built up Tom Daniel Red Baron that I purchased as part of an Ebay auction. I wanted the take what was left of the Red Baron and build a custom from a custom. 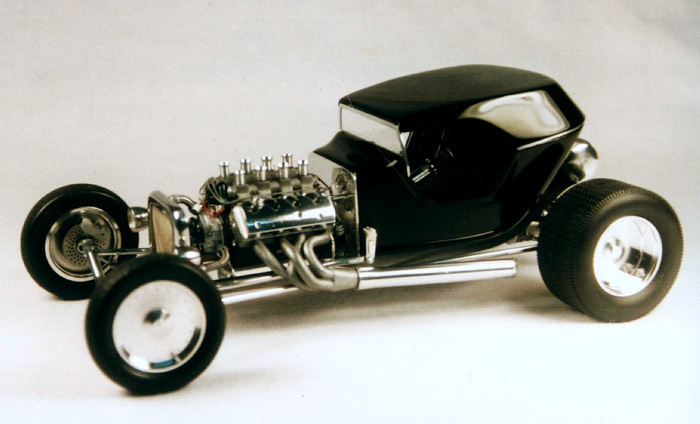 The old frame was cut from the body and a new longer frame was scratch built complete with holes drilled it below the tank to accommodate the new engine and the mounting of a machined aluminum gas tank. 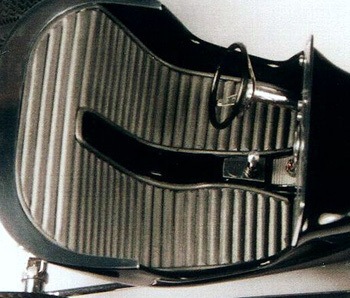 The original helmet roof was chopped off and an extension added to the front to meet the new windshield and dash assembly. The seats were ground down smooth and half round evergreen was used to make the new upholstery design. I machined the gauges, shifter and steering column on my lathe. 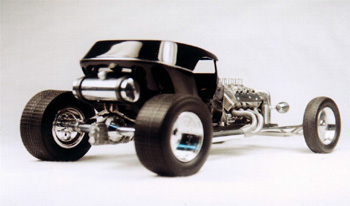 The rear deck trim, windshield frame, and firewall was hand fabricated from an old BMW computer control module housing. Other actual full size BMW parts include the radiator that was cut and formed from a bad water pump. The wire mesh in the center of the radiator that is from a used transmission filter. Attached the sides of the radiator are machined headlights with parts box lenses. The leaf springs on the front and rear are functional and made from BMW brake pad backing shims. I wanted to use a BMW engine in the car, but was unable to find one that I wanted. The engine is a Ford Pro Stock block with heads and old pan hand fabricated from more of that old BMW water pump. 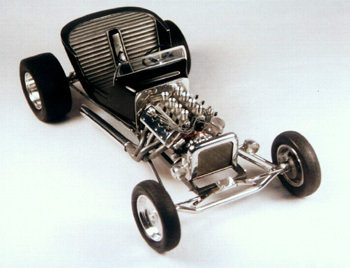 The valve covers are modified Scale Repo's Plus items with the engine being topped off with a custom made fuel injection system. Other parts that were machined on my lathe is the starter and solenoid, oil filter, breather caps and ten individual freeze plugs. The radiator hoses are made from part of a crankshaft seal, the spring that holds the rubber portion of the seal tight on the crank. The ends of the hoses have AN fittings from Detail Master. 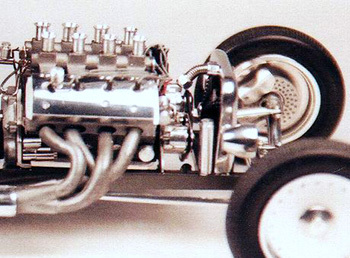 All of the front suspension, radius arms, steering gear and rear differential were made from aluminum tubing and small flat stock. The brake calipers were hand formed and filed then attached to photo etched rotors. The rear brake backing plates are from the Lil' Coffin kit. The wheels are made by JPS and the tires by Monogram. This is the first model that I've built and finished in over twelve years. My respect and admiration goes out to all of the people who chose to build custom and super detailed models. 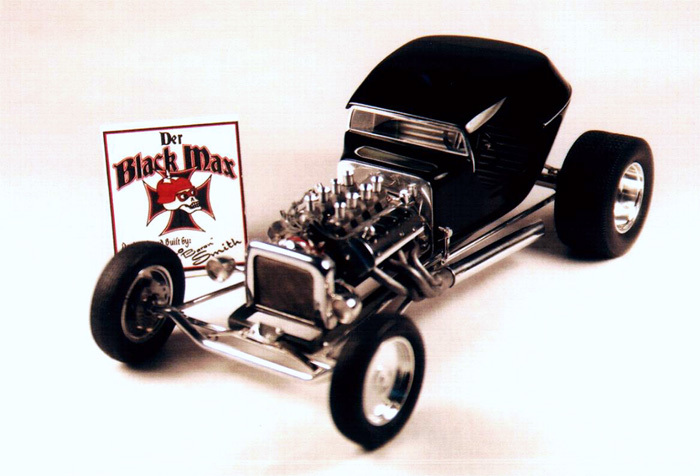 Building model cars is truly an art form no lesser than building and customizing full size cars. Hope you like the design, it was fun to build with parts from actual car parts. Now I'm going to finish that box stock car I was working on.